Interested in keeping up with the latest catheter and ostomy products available on the market? 180 Medical is always ready to share the scoop on the newest supplies with you, and today, we’d like to introduce you to Cure Medical’s latest product, the Extra Long Cure Medical® Pocket Catheter. What are the features of the Cure Medical® Pocket Catheter XL? 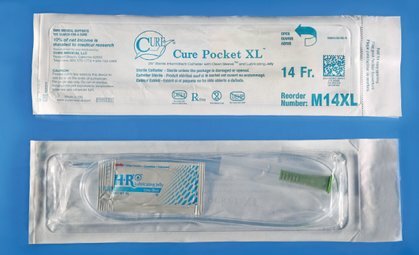 The Cure Medical® Pocket Catheter XL is an extra-long male-length catheter that was designed for those individuals who use extension tubing to make the catheter distance a little longer in order to have more room to grip or to more easily reach the receptacle such as a toilet or urinal. It is particularly handy for catheter-users who are in wheelchairs. With a catheter that is 25 inches long, there is plenty of length to help facilitate easier catheterization without having to move from one’s wheelchair over to sit on a toilet. Shorter package that can be carried in a pant pocket, bag, backpack, briefcase, purse, etc. Currently available only in 14 Fr. How do I use the Pocket Catheter XL? This catheter is designed to make self-cathing from a wheelchair easier without the need for a separate extension tube. After opening the package and lubricating the catheter with the provided water-soluble lubricant packet, you can begin your self-cathing routine. For more detailed information regarding how to self-catheterize, feel free to contact us. One of our friendly, trained specialists will listen to your needs and individual preferences and walk you through the process of catheterization. We also offer one-of-a-kind instructional materials that can be sent to you with your order, including printed color brochures and a step-by-step DVD. 180 Medical is proud to carry Cure Medical’s full catheter product line, including their straight catheters, coude catheters, hydrophilic catheters, closed system catheters, pocket catheters, and more. Just contact 180 Medical by filling out our online inquiry form, connecting to us via Live Chat, or giving us a call at 1-877-688-2729 to speak to one of our trained, friendly specialists. We are happy to find the right catheter for your needs, and we can verify your insurance to determine if and how these products are covered on your policy. This new easy-to-use hydrophilic catheter may be right for you! Get the scoop on the features of the new Cure hydrophilic catheters! Get the latest updates on catheter products with our blog and find out more about ConvaTec’s new GentleCath.